Remember when Alistair Overeem (pictured) claimed Junior dos Santos was “afraid” to fight him, an accusation dos Santos promptly scoffed at? Well, according to UFC president Dana White, Overeem is now the one scared, homie, to face the former heavyweight champion. “He wants nothing to do with dos Santos. He’s literally hiding from him,” reporter Ariel Helwani relayed from his conversation with White on this week’s edition of UFC Tonight. According to Helwani, Overeem declined a five-round main event in dos Santos’ homeland of Brazil. That’s understandable considering the scrap would be in hostile territory and Overeem’s cardio has always been a question mark. White then presented Overeem with a three-round co-main event slot in Las Vegas. White was denied once again. Overeem is currently in Jamaica, hence the need for White to claim he’s “literally” hiding from dos Santos. The rivals were scheduled to collide on two previous occasions. Overeem was initially slated to challenge dos Santos for his throne at UFC 146, but Overeem flunked a pre-fight drug test for elevated levels of testosterone and was issued a nine-month suspension. The shootout was then rescheduled for UFC 160 until Overeem was forced to withdraw due to injury. 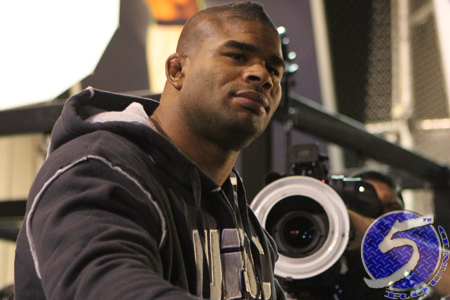 Overeem collected a much-needed win by beating Frank Mir earlier this month at UFC 169 to snap his two-fight skid. Dos Santos, meanwhile, has been recovering from getting blasted by reigning champion Cain Velasquez in October.